Sony has announced its 1st Cyber-shot digital camera with WiFi – DSC-G1. 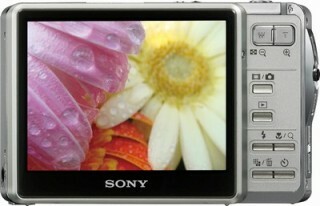 The new Sony G1 camera features a 6.0 effective Megapixels Super HAD CCD sensor and 3x optical zoom. 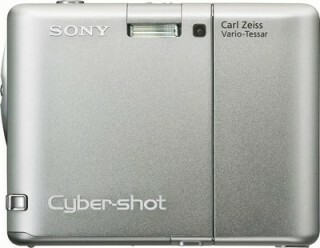 The Sony G1 also has a different design if you compare with other Cyber-shot cameras. It’s bigger and thicker than most that can fit somebody’s big hand more comfortable, and also got bigger screen than other models which is 3.5 inch large screen. The new Cyber-shot DSC-G1 also features a distinctive design, that G1’s Carl Zeiss lens is wrapped in an elegant metal body. 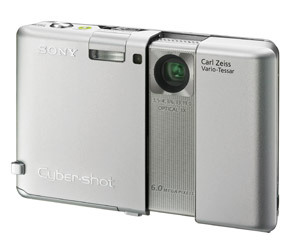 You slide the lens cover across, instead of down as with previous models such as Sony Cybershot T-Series. New Sony DSC-G1’s memory capacity can be expanded with the optional Sony Memory Stick Pro Duo that now available in 8 GB huge capacity, so there is no need to worry about the storage capacity again during your vacation. The Sony Cyber-shot G1 model is Sony’s first digital camera with the WiFi feature that can send photos wirelessly to other Digital Living Network Alliance (DLNA)-enabled devices, such as your PC or notebook. The additional special selling point that incorporates in Sony Cyber-shot G1 is the auto image management system with sophisticated search functions. You can organize your photos by events, such as vacations or birthdays, and retrieve them later by keywords or labels. The Cyber-shot DSC-G1 will go on sales by April and the retail price will be around approximately $600.